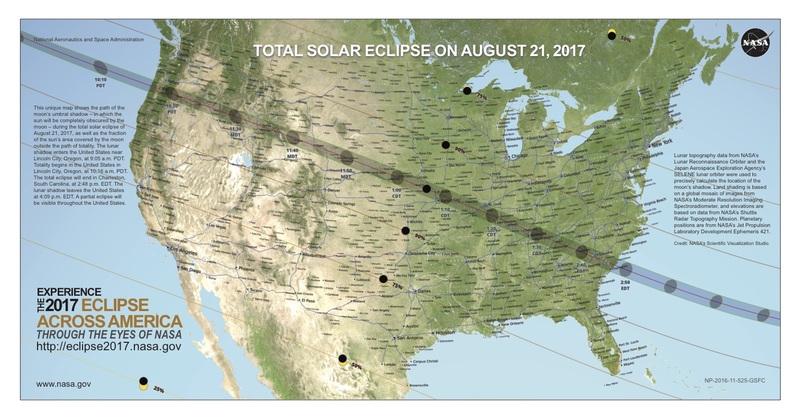 Grand Teton National Park estimated that, depending on where people were in the park, the August 21, 2017 total solar eclipse would start with the edge of the moon starting to overlap the edge of the sun at about 10:17 am and max out at about 11:35 am. 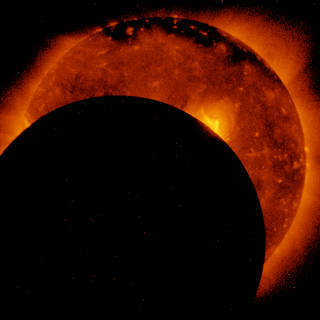 with about 2 minutes of totality (when the sun would be completely blocked by the moon) then the moon would start moving away and parts of the sun’s disk reappear, finishing with the moon no longer covering the sun at a little after 1 p.m. People back home might see about a 80% eclipse, without the ring of light around the moon (and some have told us they had cloudy skies). 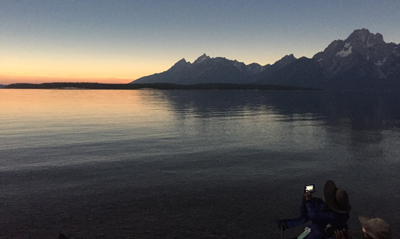 The park service warned that there would be huge crowds for the eclipse, with a path of the eclipse centered, in part, over Grand Teton National Park. 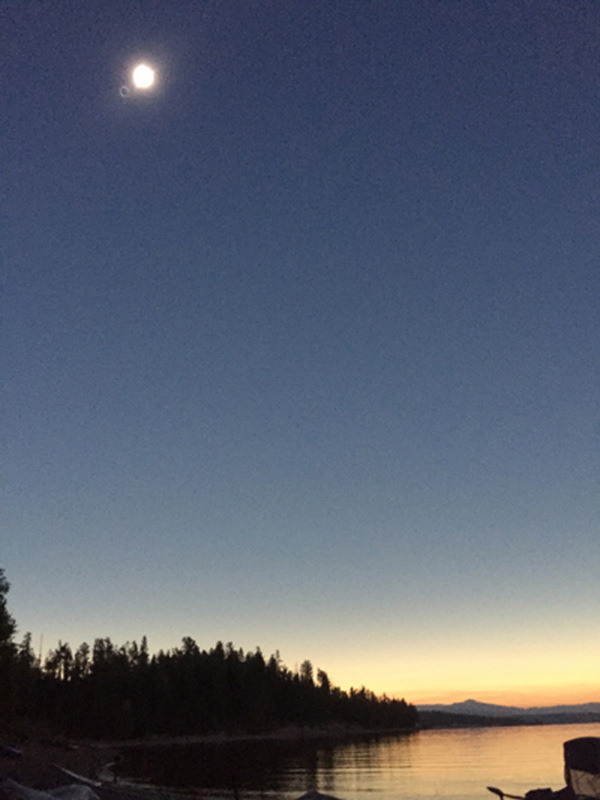 The club did not want to be in any crowd, or where there might be people howling at the moon, or where darkness activated lights would come on when the sun/moon went into totality and potentially spoil the view. 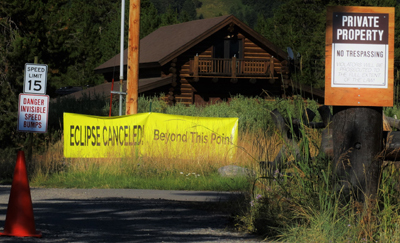 Where we picked to watch actually had fifteen seconds less totality than, for example, Gros Ventre road, which the park had turned into a one way road, with the usual second lane turned into parking spaces, (a park official said: “That’s about 1,000 cars parallel parked, at about 30 feet per car. Your car is 16 to 17 feet long, typically”) and had porta-potties in place along the roads/turnouts. 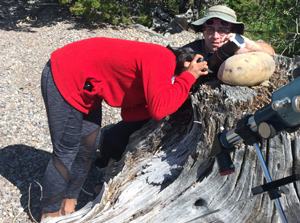 The De Anza Outdoor Club trip members think we might have chosen the best place in the park, and certainly one of the best places in the USA to watch from. In the morning we packed the kayaks with gear, including protective eyewear we had bought months in advance (some of which was used on camera lenses), a telescope, cameras and tripods, gear for a couple of eclipse viewing projects as recommended by the San Francisco Exploratorium, a watermelon, deviled eggs, solar eclipse brownies, and ooooodles of other snacks, warm clothes to put on during the totality, rain gear just in case, Tetons trip mascots (including the stuffed Bullwinkle moose that has been on Grand Teton National Park between-summer-quarter-and-fall-quarter trips for years) to head out from the Colter Bay marina into Jackson Lake. The marina manager came by the launch ramp and said he was surprised at how few boats were launching. 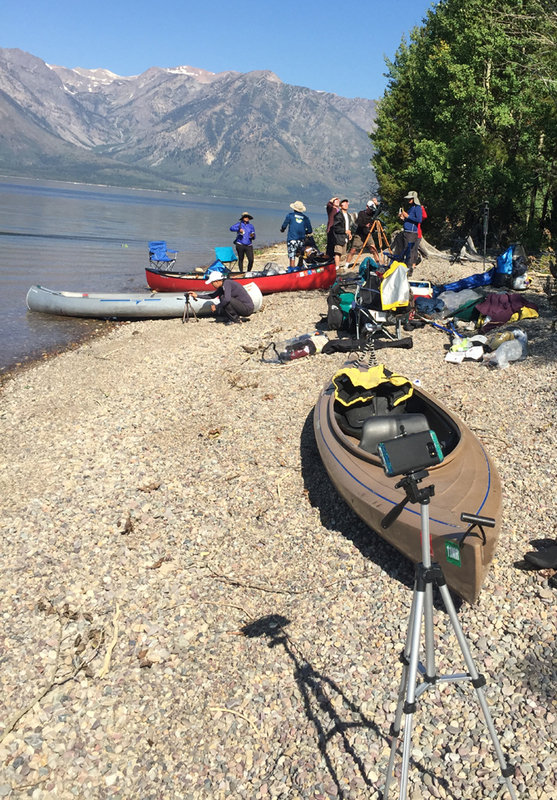 As we paddled out early in the morning we could see the shoreline already starting to get crowded with people jockeying to get a spot for their folding chairs. 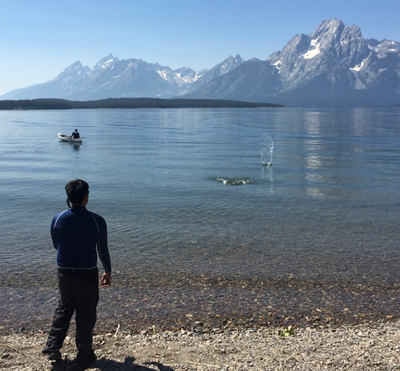 with a full view of the Teton mountain range. 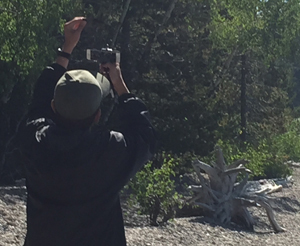 People set up their cameras, the telescope and gear. 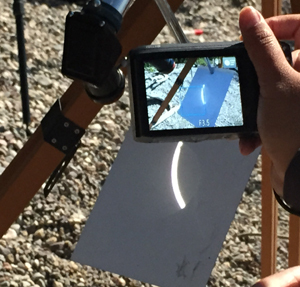 The telescope had to be regularly readjusted to keep the eclipse on the panel below it, since the sun was moving along in the sky quite briskly. 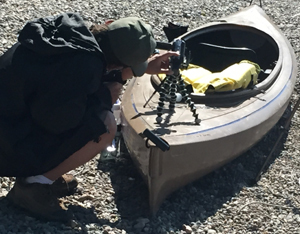 No tripod? A large tree stump and rock will do just fine. 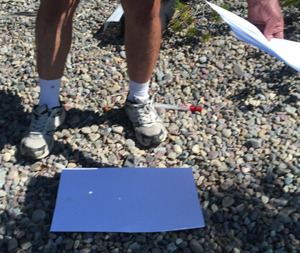 We tried the “pinhole projector” setup, as recommended by the San Francisco Exploratorium, of a white board with a pin hole in it, held up above another white board, projecting the eclipse onto the second white board, but we were quite glad we had protective eclipse glasses to watch with, as the pin hole functioned but did not give us that big of a view. A second experiment, again, as recommended by the San Francisco Exploratorium, was quite beautiful. 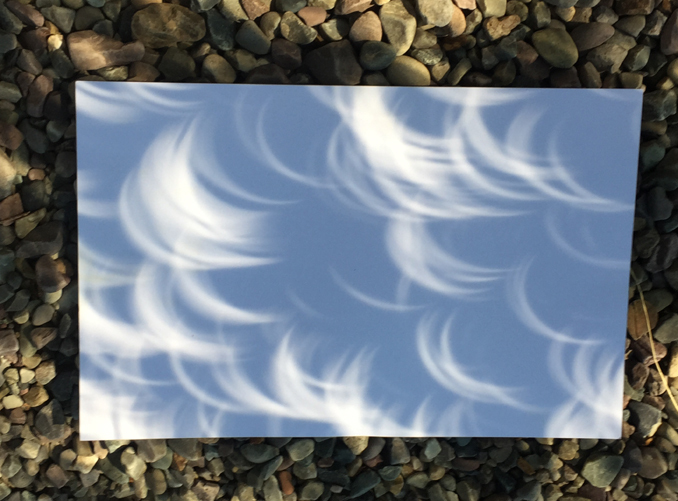 We put the white board on the ground under the gently waving leaves of an Aspen tree and it made multiple, flickering images of the eclipse. 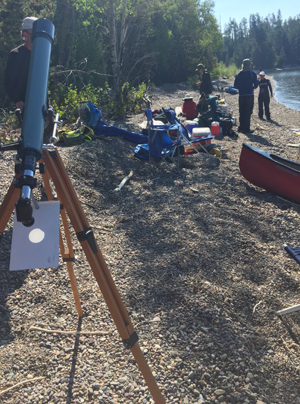 We had prepared for the totality with warm things to put on, but most of the group were surprised at how cold it got how fast. Yours truly decorated brownies with a starting partial eclipse, a totality and a finishing up partial eclipse. 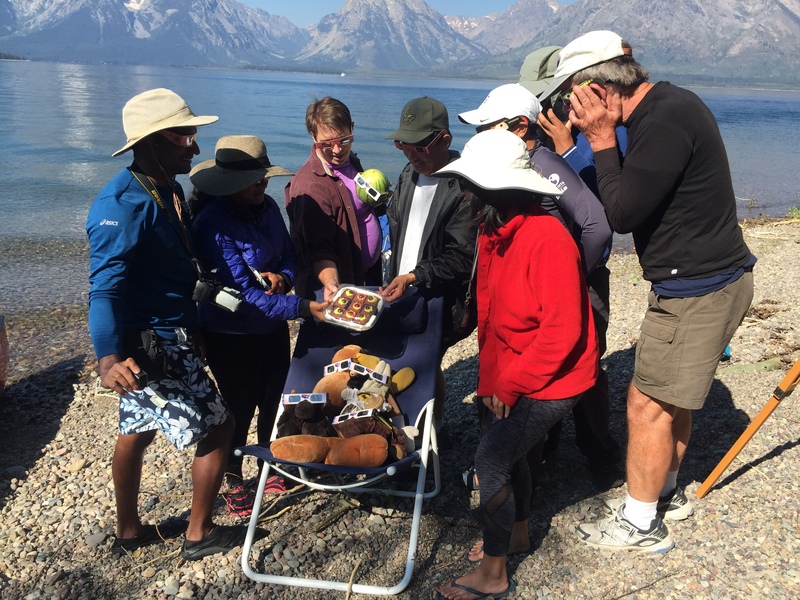 The trip participants wisely wore their protective eyewear to view the eclipse brownies. 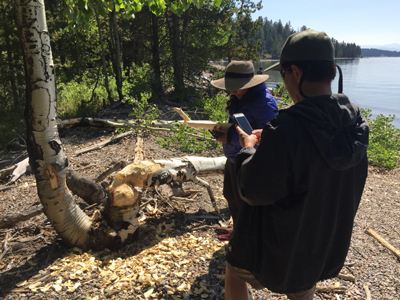 and we took a look at a few Aspen along the shore that had been recently cut down by beavers. A few days later on the hike up Cascade Canyon to Lake Solitude, we were comparing notes with other hikers along the trail. 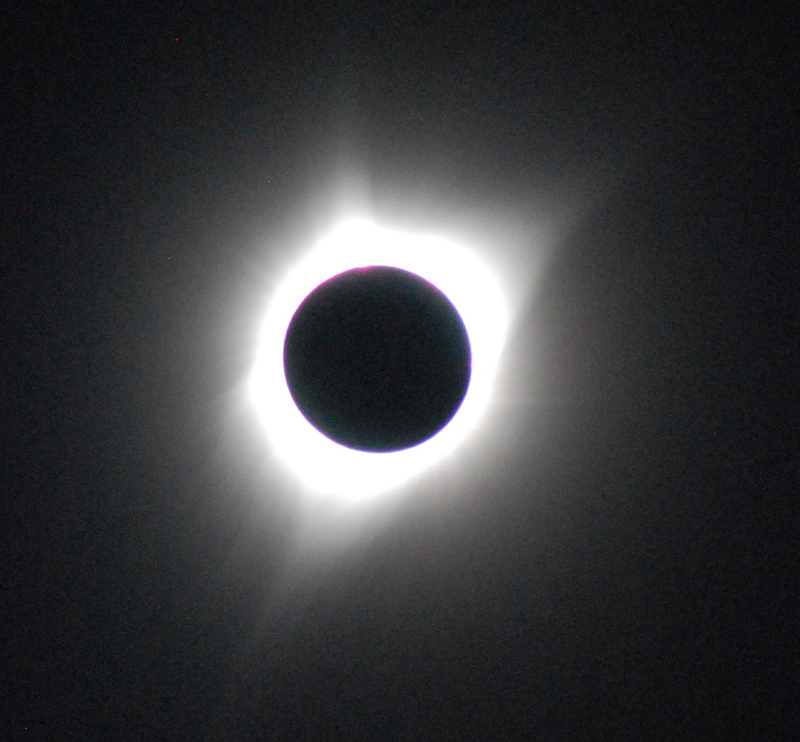 One man said he had previously seen a total solar eclipse from a cruise ship, but would not do it again because the boat rocked too much for good pictures. The Park Service and emergency managers from the town of Jackson, the Forest Service, etc. worked for two years planning for this. 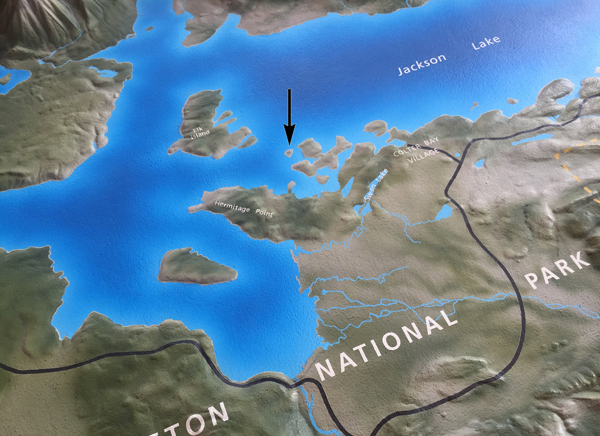 Locals were warned to stock up on groceries and gas days before, and the Outdoor Club followed that advice. 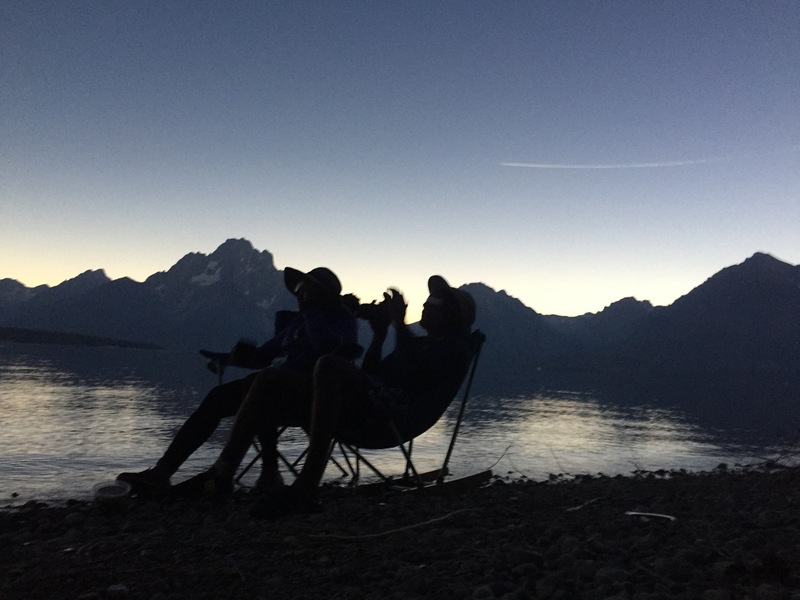 Grand Teton Park officials were correct when they said “August 21 is anticipated to be the busiest day in the history of the park.” They (and surrounding camping areas) had full campgrounds, “for the first time in park history, all backcountry permits were issued for three days straight, the days leading to the eclipse.” People were driving into the park looking for campground space the day before and sitting in their vehicles in long lines only to finding little or nothing. 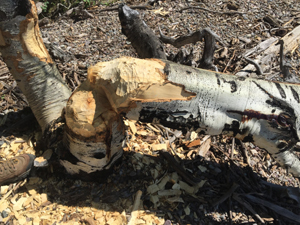 In relatively nearby Forest Service ‘dispersed camping areas’, one area of 23 spots had over 100 tents and RVS, and another of a dozen sites had 40 vehicles and tents. 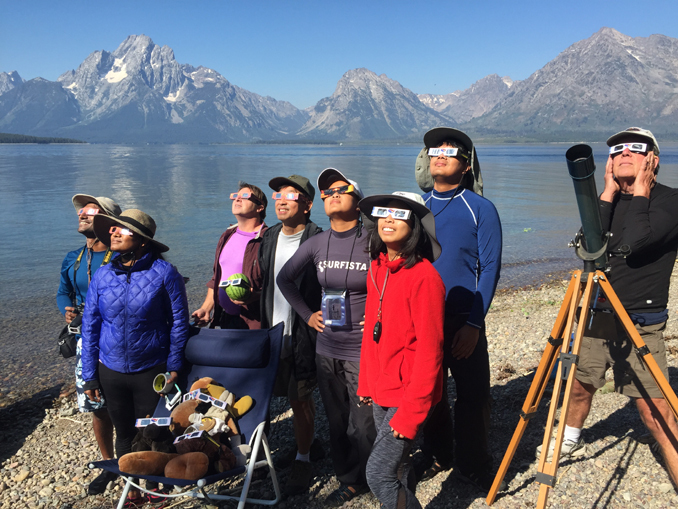 The Outdoor Club purchased our eclipse-viewing safety glasses months in advance. 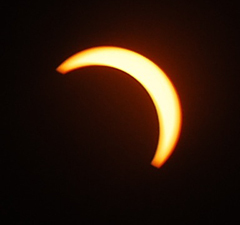 The day of the eclipse, in town the police handed out free eclipse-viewing safety glasses and in the park, the rangers did as well. Park hotels/cabins gave them out as people checked in the days prior. The hospital reported they had no cases of eye damage. The emergency preparedness teams said, in their review of the event, that it went quite well. 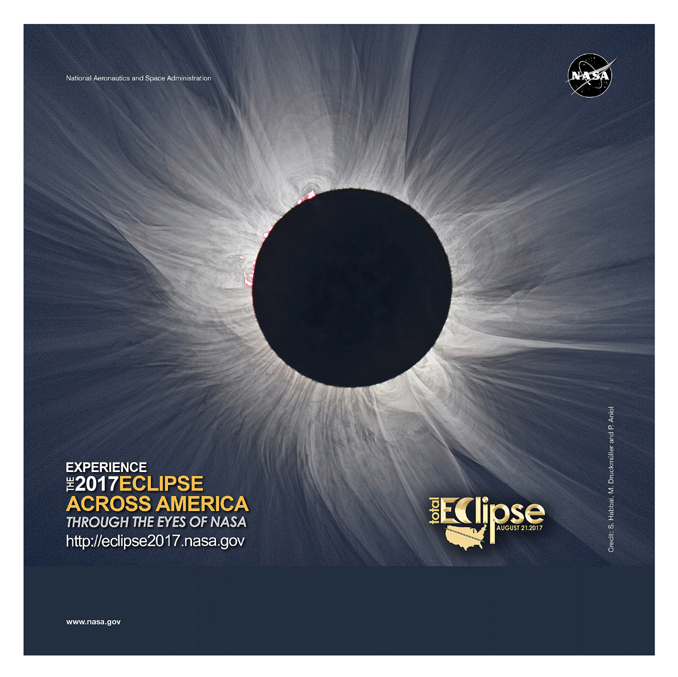 “Officials agreed there could have been better planning for the days immediately following the eclipse. I told the students to not worry about their pictures, NASA will get better ones than you. 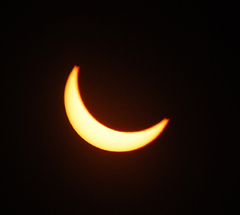 The stages of the eclipse really did look like this from 10:17 a.m. to a little after 1 p.m. 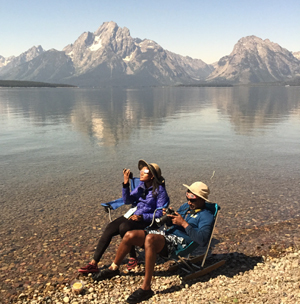 Details about future Grand Teton National Park trips the Outdoor Club will be making are at Teton trip.